I have gotten a good chunk of stuff done this weekend and week so far! I finished my Chain Link top!!! 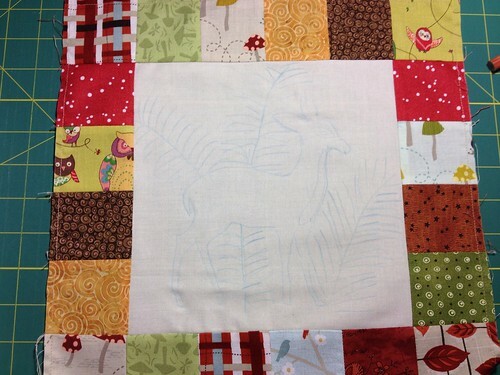 I am trying to decide on how I want to quilt it. I think simple vertical/horizontal lines will do the trick. I want to keep the symmetrical vibe in tact. Of course Marta sat in the middle of it. Because she was so insistent I had her model it. Very happy with the way it turned out! I think this one will go to my roommate Heidi. I also made some good progress on Bee blocks. 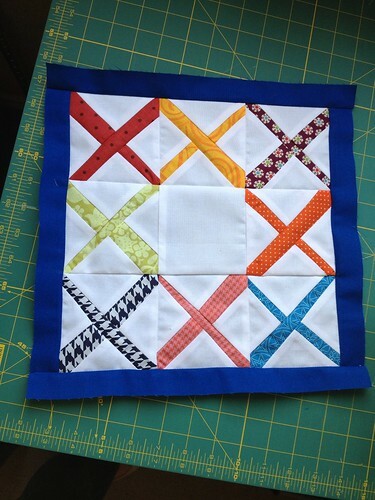 This month the challenge is a 16'' block with the theme of a family board game. I chose Cranium. I have the base of the block together, I just need to do the name and details in embroidery. I think it looks pretty similar! I also finished my We Bee Modern Too block from the Modern Blocks Book. I got to finish this on my new Sewing Table!! It came together very easily. I might have to do some of these for myself! I think they would make adorable pillows! I also started the embroidery on Maripen's Hoop Up Swap piece. Her inspiration was Woodland Creatures. 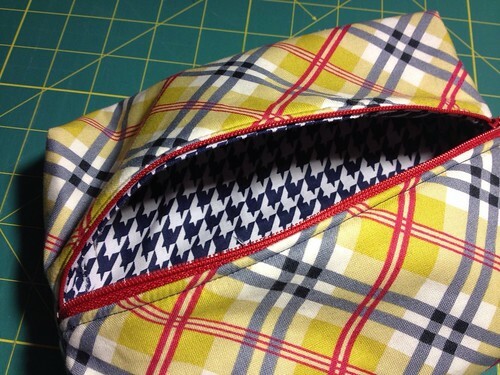 I also jumped on Danny's Zippered Pouch Tutorial. 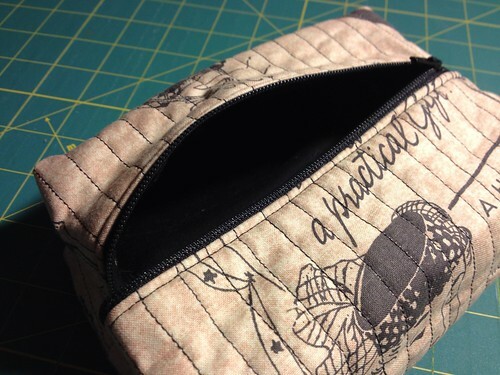 I had made a Dumpling pouch a couple of weeks back for my make up but it didn't hold much. 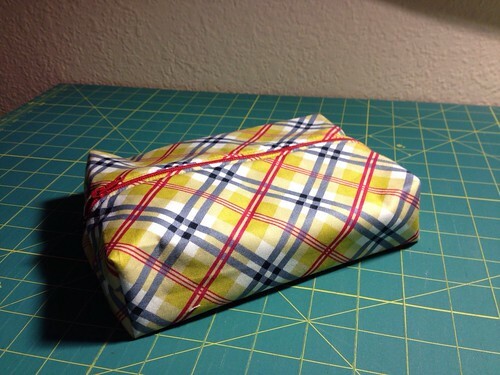 So I decided to enlarge Danny's pattern and make one for myself as my new makeup bag. I had found this fabric at a LQS and loved the vintage look of it! 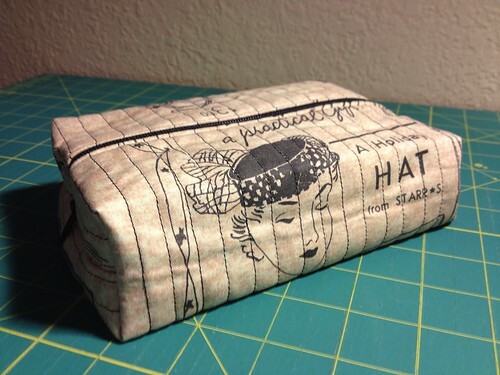 After I had made that one, my boyfriend saw it and was like man, I could use a toiletry bag. So I told him that if he would bite the bullet and go to Jo-Ann's with me and pick out his own fabric, I would make him one as well. Here is what he came up with. I've done lots this week but will be going to Mardi Gras this weekend through the middle of next week so won't get much done till next weekend. I have a massive load of packages of bee blocks and Fugly Fabric packages that I will be sending out tomorrow. 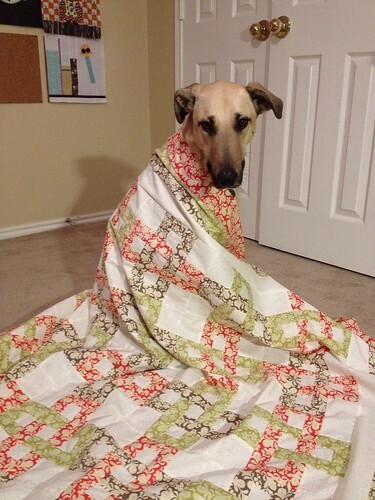 Your quilt is so pretty, and your doggie is doing a wonderful job modeling it! Your bags look pretty nifty, too. It's done, it's done and it's beautiful! 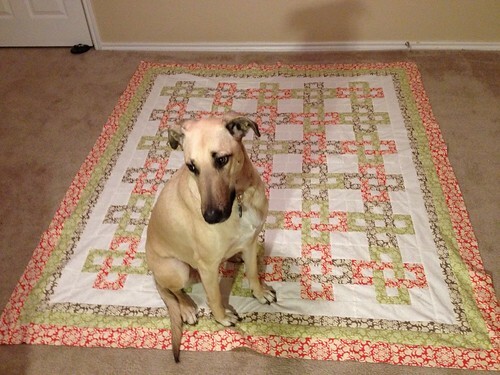 I love this quilt and the picture of the poochie poo draped in such a lovely work of art! Congratulations and I'm so glad you added those borders! Love this quilt,absolutely fabulous.Everything is gorgeous! What a beautiful model, she shows off the quilt so well! 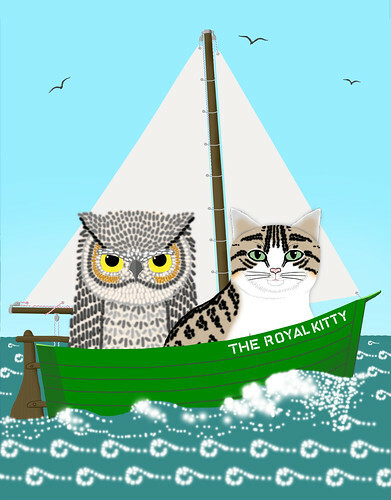 I hope you enjoy making the owl and the pussycat block, I used to love reading it with my Dad when I was little. This is the beautiful model.I really like this box.It colorful and designing.I really inspire from this box.It look so fabulous. You've been busy, Colby! 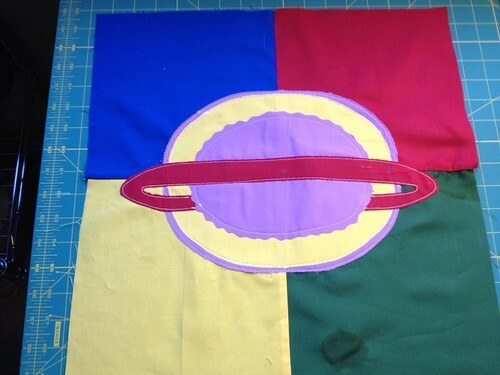 I love the colors you chose for the bee block and can't wait to see how you embroider the Hoop Up swap piece. Looks like it's going to be a cute one. 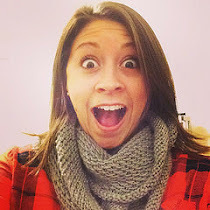 You have so many cute projects. I especially love your vintage bag and the quilt is wonderful! Your puppy is so adorable. I love how pets always want to "help" when you're working on a project. My pug is exactly the same. I also really like the Cranium block - I've been thinking of starting a quilt that looks like the board game Settlers of Catan. 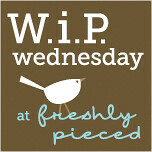 Nice to meet you via WiP! Hi! I love your works and Marta is so beautiful with that lovely quilt!